1. Open the front cover. Brother MFC-9840 can be used with two toner models, TN-110 series and TN-115 series. 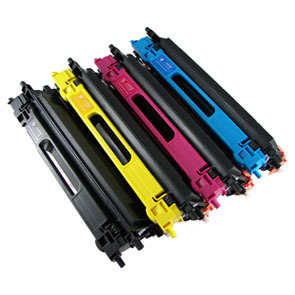 TN-110 series are smaller toners with lower page yield and TN-115 series are larger toners with higher page yield. Please note that for multiple unit reset, you can only select one toner at a time and repeat the steps for the remaining unit/s. These steps should do the trick. If the printer no longer shows remaining ink level during each print job, you can still tell when the printed documents start to have slightly fading color or printing quality began to deteriorate. In most cases, you should get at least a couple more hundred pages after resetting the toner units before you have to actually replace the cartridges. 5,000 pages at 5% coverage per page for the black toner unit. 4,000 pages at 5% coverage per page for the cyan, yellow, and magenta toner units. Remember to use the coupon code “NY2012” for 10% off entire purchase before the code expires. Also please remember that all shipping is free if the purchase is over $75.